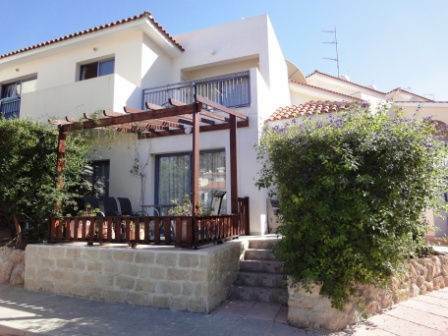 Kato Paphos, Paphos - This semi-detached 2 bedroom townhouse is located in a quiet cul-de-sac in the Kato Paphos area. Paphos Town is a short drive away. The ground floor features an open plan living room including lounge, dining area and kitchen, and there is a guest cloakroom at the base of the stairs. Patio doors lead from the lounge to a pleasant veranda with wooden pergola and greenery/fencing all around. Stairs lead up to two double bedrooms with fitted wardrobes, and a family bathroom. There is also a large store room which is currently used as a utility area, and further built-in storage cupboards on the landing. The master bedroom has a good size balcony with a great view of the communal pool and gardens. This property is ideal as a residential or holiday home. The furniture is included and there are full title deeds.